As you walk through a museum or art exhibit, there doesn’t seem to be a right or wrong way to examine it. However, by simply looking at the piece and walking away, acknowledging and appreciating the work becomes more difficult. This fact is mainly because people don’t take the time needed in order to examine what their eyes are looking at. Ian Berry, the Dayton Director of the Tang, explained that the best way to look at art is to look carefully at the subject. Berry explains that in actual museums, you can “see things that you don’t get from a reproduction,” things that wouldn’t be there in a photograph of the piece. He explained this phenomenon of seeing by referencing to the “Two Towers” piece in the 3-D Doings exhibit at the Tang. In “Two Towers,” it can take several moments to see that there is a painted shadow at the base. If one were to look quickly at the piece, they would not notice this subtle detail and think it is a real shadow cast onto the sculpture. Berry mentioned that this aspect of the piece is done intentionally by the artist to add little details that may be overlooked or misinterpreted if the piece is not examined properly. By creating a shadow, the piece becomes more impressive, as it suddenly has this particular abstract detail that makes the towers seem much more realistic as if they were actual, bustling buildings. Art pieces carry many specific details that people often do not notice, but they are ones that enhance the work drastically. Once they are observed, the piece becomes something much different, which is the exciting aspect of looking at art. Those who work at the Tang, as well as art students, are not the only ones who understand this crucial way of looking at art. Geology professor Jennifer Cholnoky also agreed with the interdisciplinary action of paying attention to the fine details in a piece of art. Cholnoky teaches Geology 101, and often times incorporates the art in the Tang into her labs. Cholnoky, along with help from staff at the Tang, pulls specific pieces of art to look at from the Tang collections. She then has her students pick one piece that resonates with them and asks that they write about what they see during a ten-minute observation period. This activity of intense observation forces students to inspect every aspect of the art they are looking at and not just glance at it quickly. The students then talk to others about the pieces they choose, and explain how it relates to geology, such as how aspects of the art can look like certain rock folds. Through doing this exercise with her classes, Cholnoky realized that “you can look at art many different times and see things that you didn’t see before.” So, even if you look at art for a living or go to numerous museums, you still may not be seeing what the artist is intending for you to see. It takes a close eye and patience to fully understand a piece. Cholnoky gave the example of the Perched Rock in Arizona (pictured below). 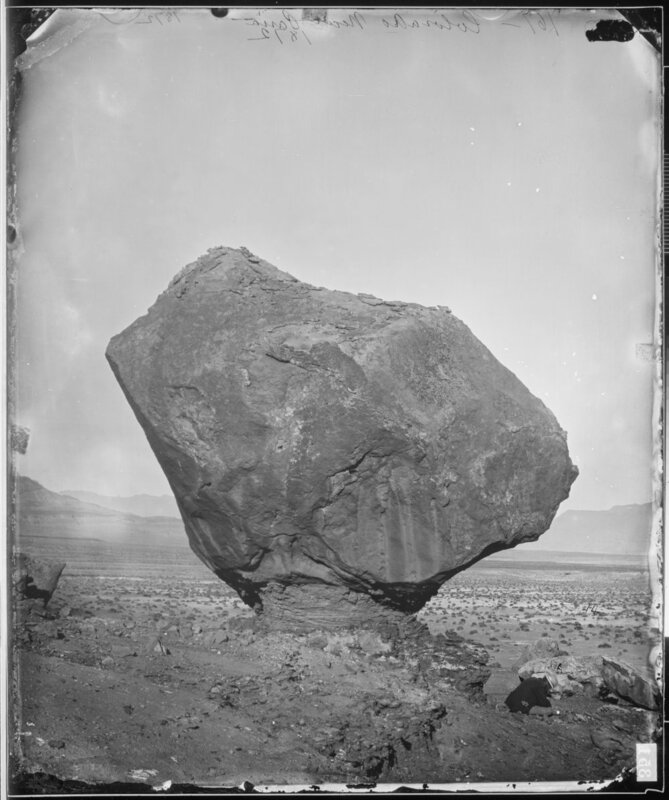 She recounts how her students examined this photo and questioned the size of the rock, since there are no surrounding objects to help tell the scale. After many different classes and many different student perspectives, one student acknowledged the man squatting in the bottom right corner of the image. Even if you examine a piece of art for three hours, you can still miss something that someone else notices in ten minutes. But this is what art does. Art creates perplexing thoughts and continues to amaze with the details that emerge every once in a while. Art History Professor Kristi Peterson also emphasized this theory of carefully looking, which she tries to instill in her students. During her classes, Peterson has students partake in assignments called “visual analyses,” which allow them to focus on different aspects of an art piece. Unlike sculpture pieces, which you can look at up close in-person, art that has been photographed for the intent of showing to multiple audiences takes away the ability to look up close, which is the easiest way to notice small details. Peterson explained how there is “no substitute for being in front of art.” Art found on the internet comes in different forms due to different editing styles, so it is sometimes hard to gage which is the most reliable image to look at. She notes that sites with a particular “level of trust,” like the Museum of Modern Art, are thus the most reputable. These sites allow her to find the best images to examine, which become helpful in looking at every detail that the piece holds. She then mentioned how, when doing visual analyses with her students, she emphasizes three steps in how to examine the art she presents to them. Step one included taking in what’s in the image and noting how your eye flows through the picture. Step two included paying attention to the things that jump out at you and examining those particular elements. Lastly, step three was paying attention to the small details that can be noticed. By actively trying to examine each different aspect of a piece of art, it can help students find the little details that make the piece complete and show its true meaning. Looking at something closely is not just a skill that is helpful for art or for a single discipline. It can also be used regardless of what the subject is, which is something that shouldn’t be taken for granted. So, next time you’re out and about, whether it’s the Tang Museum or street-side sculptures, make sure to truly view that art.